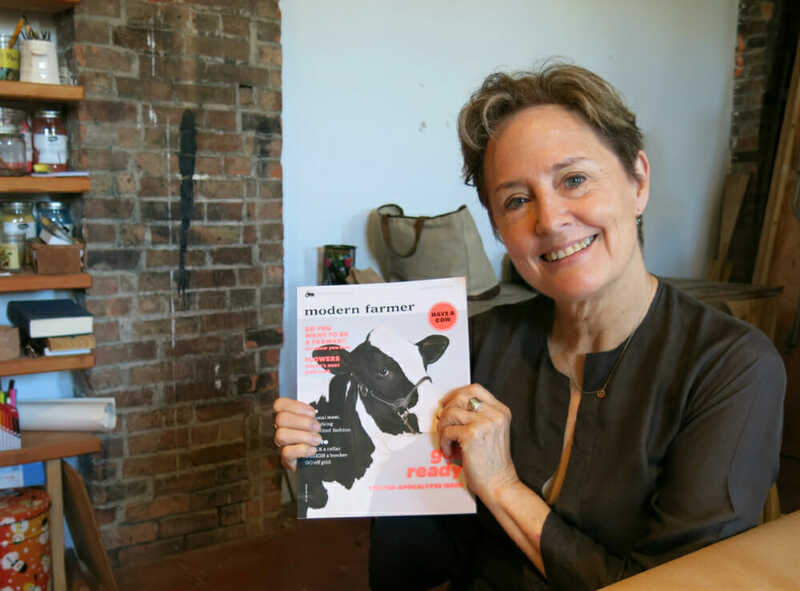 If you had 10 minutes with Alice Waters, what would you ask? She’s beloved for planting the seeds of the local food groundswell and for tirelessly stumping on behalf of school-grown veggies. Yet Waters often stands accused of foodie elitism: not every American can stock their kitchen with heirloom tomatoes and grass-fed beef. Anthony Bourdain has been particularly vocal about his disdain (while also giving her much respect). A walking embodiment of the uppercase Food Movement, Waters’ presence can be, by its very nature, imposing. I’d heard tell of her evasiveness in interviews — a willingness to let uneasy silence hang in the air, to provide a piercing stare in lieu of a response. Even just getting face time with Alice Waters can be a trial. However, when she visited Hudson, New York, last weekend, a town of 6,500 that just happens to host Modern Farmer‘s HQ, we saw an opportunity. Reasons for her visit were legion — keynote speaker at TEDxHudson, a farm-to-fork dinner with Etsy, an Edible Schoolyard pow-wow — but we managed to carve a small slice from her hectic schedule. Waters and I were given 10 minutes to chat; once we started, I realized how sadly inadequate that would be. At the eight-minute mark, when a PR assistant told us to start winding down, Waters said: “Things were just getting good!” Indeed. Modern Farmer: Can you give a progress report on Edible Schoolyard? 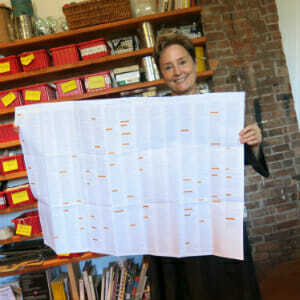 Alice Waters: What’s going around the country, and even around the world, is multiplying geometrically. Farmers can bring food to the children and the values that come along with farming. This was absolutely Jefferson’s idea. Democracy was informed by small farmers who had to live on the land. Those values are what kept us on the right path. And that’s one of the big reasons we’ve fallen off the path. MF: Growth has been very rapid, right? There have been a lot of new schools getting involved. AW: I have a map. (Runs and grabs Edible Schoolyards map, with program numbers in every state.) These are the numbers in all states. It’s part of our annual report. That lists 4,500 total. MF: There’s been kind of a tendency for food movements to start at the coasts and trickle in. I’m looking at the map and I’m seeing that Indiana has a bunch [of Edible Schoolyard programs]. How much progress have you seen in the Midwest? AW: Of course a lot is generated out of Madison, out of Chicago. But I think we really need a national voice. There are a lot of people talking about this in lots of different ways. We’re coming together as a movement, but we’re not quite ready to shout it out. MF: Who are the biggest voices at this point? AW: Clearly people like Michael Pollan, Marion Nestle, Eric Schlosser they’re REALLY thinking about farmworkers, and about health. Michael’s point of view is so beautiful because he is a teacher and he’s a brilliant, kind of creative thinker that really reaches everybody to wake up. I mean alerts them. He’s quite compelling. I mean, he’s amazing. MF: I’m going to change tacks a bit. When I lived in the Bay Area, I was able to access fresh produce year-round. The farmers’ market didn’t really have a hiatus. What advice would you give to someone who lives in Hudson, New York? AW: You just have to be prepared to live differently. MF: So, what does winter look like? AW: Winter looks like… when I go to New York, I go to the farmers’ market in Union Square in the middle of winter. And there’s always something there. There may be greenhouse lettuce, and radishes, and little carrots, and maybe that, and herbs. I can always find some eggs. I can find some meat. I can find a beautiful cabbage. You know, things like turnips of all varieties. I get nuts and I get dried berries. I just think about eating differently in the wintertime, I’m depending on bees. I depend on bees. And I depend on fish, different kinds of fish than I get in the summer months. I’m looking to potatoes, all the shapes and sizes. I’m thinking of sweet potatoes in a big way. I think it’s beautiful that you can make tortillas, fresh tortillas. They’re very much a part of my diet in winter. MF: Greens are obviously more tricky. It’s great that Union Square Greenmarket can get those, but let’s say you’re living remote. Would you say it’s okay for someone to buy supermarket greens? AW: Well, I’m a big green eater. You know, I’m a search it out kind of person. I would go around to find the farmers. MF: So, no cheating? No buying imported greens from South America? AW: No, there’s none of that. But there might be some greens that are organic, that are coming from a farm in North Carolina and maybe I would make that an exception because I really love them. Or maybe a foreign organic. I really want to know where the farm is. I do that research. When I can, I’ll go out and visit the farm or the ranch. MF: Is a lot of it indoor-grown? AW: Some of it is indoor-grown, but it’s different things. It’s using cheese. It’s using different kinds of meat things that are dried. There’s always some beautiful kind of prosciutto there. There’s olives. There are always some canned tomatoes. MF: So, more focused on meats and root vegetables and whatever you can get? AW: Exactly. But I can’t do without greens. That’s an impossibility. JH: Agriculture is kind of having its moment. Would you say that’s a good thing? The fashionability of it. AW: It needs that, just like we needed the chefs who were talking the talk to make people aware in this fast-food culture that there’s something really valuable. And maybe it’s not really … that it feels trendy. It has to do with our survival and it has to do with the way we’ve thought about feeding us ourselves since the beginning of civilization. We are not talking about anything new. Eating locally, eating with family and friends, buying from the farmer next door, storing things for the winter months, sharing your crops, exchanging those things, saving seeds. JH: Have you had a chance to check out Modern Farmer? AW: Oh yes, I am familiar with it. JH: Do you have any comments or criticism? We’d love feedback. AW: I’ll read this issue with that focus in mind and I’m so happy to talk to you later. (Runs toward door, then pauses.) It’s so important, what you are doing. We need to attract more young people into the culture of agriculture. We need to make raising goats the most attractive thing possible. If we don’t make it attractive, we will fail. This is about the most important life’s work imaginable, growing food to feed people, to do it with care. As Carlo Petrini says, “Farmers are the intellectuals of the land.” I am counting on that brilliance.